There is a legend tells that, in an immemorial time, the king Shango, orisha chosen by Obatalá to rule over the land and the others gods, had many wives. The most important was Oya (or Yansan), godess of the storms, and Oshum, whose domain is extended to the rivers, lakes and waterfalls. A certain day, jealous about the preference of Shango for her rival; Yansan decided to revenge from Oshum and, in an intempestive ray of fury, invested against the mother of fresh water while she was bathing naked by a great lake, having only a mirror on her hands. Due to the fact of not being a warrior, but a docile and vain woman, whose only defense expedients are seduction and dissimulation; Oshun saw herself completely helpless before the entrancing anger of the Queen of the Lightenings. Oshum, then, praid for Obatalá and, in one magical instant, she noticed that the Sun shone strong on hers oponent's back. Quickly, she used her mirror to reflect the sun rays in a way that blinded Yansan. When the king Shango knew about the victory of Oshum, he reaffirmed his preference for the godess of the waters, that is not only more beautiful and delicate but also proved to be more powerful than the godess of the Storms. The mirror is present on innumerable myths and ‘reflects' a clearly universal significance for its cognitive and epistemological value. It is a symbol of the conscience. Conciense understood not only as `social or profissional self image', but, above all as a profound psychological identity, the true face under the mask of ego, the luminous spark, the inner reflex of 'Fiat Lux'. Plato and Plotino compared it to the soul, metaphor that was later adopted by the Saints Atanasio and Gregorio Niseno. But it is with Saint Paul that the Mirror becomes a powerfull symbol of transformation, a double instrument for the antropomorphical knowledge of God and the cosmological knowledge of Man. But if the Mirror is symbol of the mystic self-knowledge, of the image and similarity where Man and God reflect each other, it also appears constantly as a metaphor of the narcissistic illusion, as a confident of the beauty of the ego, as an inverted reflex of reality. The symbol of the truth is, at the same time, sign of falsehood and illusion. And certainly it was this paradoxical and contradictory characteristic that created `the fascination of the mirrors'. Out of the innumerable narratives where this fascination is manifested we choose the Nago myth of the Mirror of Oshum, originarily collected for Pierre Verger in Africa (2), becouse it presents some symbolic elements important to characterize the archetypical functioning of the myths that constitute the specular device and its epistemological strategy. However, before we analyze the various symbolic aspects of this mythical legend, we will study how the theme of the mirror is manifested in other narratives of different cultures, trying to identify its relations with one single archetype, that may clarify the universal role that the Mirror plays in the Nago legend. Due to the fact of not emanating proper light, but refleting it, the mirrors had been associated to the moon during all antiquity. From this key association, it arised others that relate the Mirror to the feminine and its beauty. The lunar symbolism of the mirror, however, it is not limited to the women and to the poets who sing their beauty, but also find place among the wizards and magicians, who used the reflecting surfaces to get in trance, as the Siberians Shamans. Possibly, the tradition of magical use of the mirror has had its origin in the fact of it being used in astronomy/astrology to determine the movement of the stars in the sky. It is not without reason that the verb to speculate, a mental operation, proceeds from the Latin word especulum, that originarily meant to observe the sky, to admire and to study its constellations. As the scholars of the asters science of this time were, invariably, also wizards, the mirrors were, gradually, interiorized. ” In a way that” - says the cabala specialist Mario Satz(3) - “the mirror is not only outside of us, as a metallic artifice, a polished disc saw in the dressing tables or the harem, but it is also between the cerebral hemispheres, that invert the contemplated, swiching the left to the right and vice versa”. It is curious to observe that this double process of representation of the reality through mirrors was developed parallely in diverse ancient cultures - China, India, the Middle East and the Mediterranean - generating different astrological mythologies, but only one universal conception of representation. Also the Zohar recommends that, in order to man to know its glory, to use a mirror, observing it indirectly so one will not be blinded by its own radiating luminosity. Which means to say that the subject of the Mirror is a unamimity between the mystic, whereas they are Jewish, Christian or Muslim. Perhaps this curious consensus explains the belief, also universal, that breaking a mirror causes a long period of bad luck. Also the belief that ‘creatures without soul under the human form', as the vampires and zumbies, do not have their images reflected in the Mirror; could have its origin in the universal association of the mirrors to the holographic image of God in Man, made in diverent times by different religions. Ahead, when we analyze the legend of Oshum, we will see how, due its universal association with the moon, the mirror keeps a direct relation with the aquatic symbolism, but it differs from it for reflecting the light of the elementary fire. Now, the important thing is to understands that when talking about the symbolism of the Mirror, not only the mithological illusion of Narcissus or yet the useless feminine vanity, but also of mystic contemplation before the light of a transcendent limb. But if the mirror is useful so that the gracious maidens and cortesans strengthen their egos and so that the mystic scholars get rid of theirs, it is also is a powerful war weapon, used to set fire. Generating fire at a distance through luminous rays, as in it the celebrated episode atributted to Archimedes de Siracusa, that, with a gigantic catoptric mirror would set on fire the ships that tried to invade the ancient island of Sicily. Out of all the legends involving mirrors as a weapon, the most known, is, without a doubt, the fight of Kadmo against the Medusa, told by Plato in Timeu. In this narrative, the hero wins terrible gorgon, whose glance has the power to transform its opponents into rock, with the help of a mirror tied to his shield. Kadmo made the Medusa to see her own image reflected in the mirror thus having the same destination of her victims, being petrifyed forever. That is, the mirror is a weapon capable of making the other to recognize himself, making so that the adversary becomes conscious of himself and his projections. Evil, recognizing itself exactly as such, loses its effectiveness and surrender to its own conscience. Perhaps bacause of this, in his book De Natura Deorum, Cicero remembers that the Mirror is an invention of Esculapio, the god of medicine; and that the ancient nahuas priests of Mexico used to take a mirror hung in their chest so that “other (men) discover their true face correct themselves” (6). Sadly this symbolic expedient had not worked with the Spanish conquerors. These, by the way, had carried through good part of the conquering of the Americas through the seduction of beads and mirrors, giving it out to the natives, so that while they lingered themselves with their reflexes, they did not notice what was being conspired on their backs. It would still fit to remember that the overlapping of aparently contrary subjects made the mirror symbol a metaphor of the pre-scientific epistemological paradigm, and, later, due to its passive reflexibility before the conscientious thought, the mirror started to be compared the unconscious itself - as we will detail later about the relations of the specular device with the human sciences. 'Mirror, mirror of mine, is there an intellectual wiser then me? 'In a first level, the reflex on the mirror will always be a questioning of the ego about itself. But the mirror never answers, even better, it never disagrees, on the contrary, its perpetual partaker silence becomes intimate of the most immeasurable comparisons. The form and the reflex observe each other. You are not the reflex. But the reflex is you. The reflex, however, is not only a shade: in some narratives, the double rebels against its matrix; in others, the Other releases itself from a parallel dimension through the Mirror. In every case we can observe the idea of dimensional door and in many times the idea of the reflected image, the double, as a vehicle of the I to imaginary trips, one `astral or dreaming body'. Even in the stories where the double rebels against the protagonist and acquires proper will, this relation exists, therefore the Other rebels against its original function that is to represent the form in the world of the reflexes, to duplicate the ego in an image that allows self-knowledge. However, the mirrors still keep a deeper meaning. Among the Tibetans, the Wisdom of the Great Mirror teaches the supreme secret: that the world of the forms that is reflected there is no more than an aspect of the sunyata, of the vacuity. Patanjali (9) called this knowledge ‘moveless flow' and it is not rare to find similar stories from mystics of different traditions. To them, the Mirror is a symbol of secular transcendence, of a-historicity, of the overcoming of the continuity of the sensorial perception by the flashings of eternity. But if we see in the Mirror this emblem of collective soul, or at least, if we find in it a symbol of the culture or the most abstract and paradigmatical metaphor of the language, we can compare its syntagmatic reflexes with the archetypes, therefore while the specular device emphasizes the difference, its specters always reaffirm the symbolic identity. On themselves, the reflexes are never ambivalent, they are only duplicated images. But the Mirror is not simply a duplicator structure because it contextualizes and even transforms the reality, once that brings the observer to a contemplation of the whole of the representation. While the reflexes charm and deceive us as archetypical identities, the Mirror represents the conscience that some of these identities are partial and ephemeral. The Mirror is an invitation to eternity, as, by the way, is suggested by many legends that associate it with longevity and with keeping beauty by supernatural ways, out of which “The Picture of Dorian Gray” is certainly the most known. Much more still could be said about the mirrors and its extensive symbology, however we had already congregated the elements necessary to the analysis of the Nago legend that we consider initially. Let's come back, then, to the myth of the Mirror of Oshum. The narrative starts saying that Obatalá, 'in a immemorial time', delegated the government of land and of the gods to Shango, bahaving as a 'oticius god' or uranian, that creates the world and hand over the administration to one of His children, minor gods. For a happy coincidence, this concept of 'God-Father' existing `beyond the sky' was established by Mircea Eliade (10) exactly studying the Yoruba culture, where Olorum go out and delivers all power to Obatalá. The beginning of the narrative, therefore, express a duplication of the cosmological myth. It is a matter of `imemorial time', but not of `primordial time'. We could, making a coarse analogy between Greek and Nago mythologies, say that if Olorum corresponds to Uranus, Obatalá, although its eminently solar role in the analyzed legend, would be the African version of Chronos/Saturn, and even, Shango, of third divine generation to conquer the power, would correspond the Zeus/Jupiter. By the way, as we slightly said, there are not few nor small common symbolic elements between Shango and the Greek and Roman king of gods, therefore both have sacred axes, launch lightennings from the top of their mountains, represent archetype of Justice and, over all, have multiple hierogamical love affairs with diverse goddesses that represent different aspects of the Nature, always feminine. In our story, we have a fight, not between two women, but between two of these feminine aspects of the nature: Yansã, Queen of the Lightenning, the Wind and the Storm, mistress of the eguns and of the world of the deceased; and Oshum, the Mother of pure Water and mistress of the oracle of the Ifá. 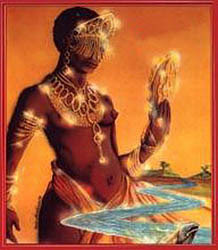 Oshum is also the goddess of love and beauty, a ‘Nago Aphrodite'. The temper of the goddesses are very conflicting. Oshum is the example of the submissive and apparently docile woman, but, in the truth, it is seductive and dissimulated. Yansan, in contrast, incarnates the ideal of an independent and sincere woman, but of irascible genius. She is also the female orisha who has more love relationships with others gods, a characteristic that, however, does not make her less jealous and possessive. The lady of the water could do nothing against the force of the wind. Oshum could not use her customary weapons, seduction and lie, but in order to invoke the solar power of Obatalá (the self), she had to transcend its narcissistic and reflexive condition. The overcoming of this initial vanity of the mirror is what allows Oshum to use it as a real weapon and not as a 'instrument of psycho- analysis' as the hero Kadmo before the Medusa. E this is a key point of this legend: only with the aid of the element Fire, the mother of waters becomes also the lady of the Mirror and triunph over Yansan. And thus conquer definitively the preference of Shango. One could also thing about the combat of the two goddesses as a fight between a militant feminist against a futile woman. But this way of putting things will not help to understand the outcome of the legend in other way then as a moralist warning that the more adjusted feminine behavior is the dissimulated submission and not freedom, autonomy and equality before manhood. However, this interpretation is mistaken. Nago mythology is amoral and it is not worried about dictating moral models of behavior. In the truth, the victory of Oshum has two meanings for the Yorubas: it represents, first, on the point of view of agriculture, the preference for moderate rains attributed to Oshum as orisha of fertility then for storms symbolized by the marriage of Shango and Yansan. And, in the religious field, the victory of Oshum represents the superiority of the oracular activity symbolized by the mirror (collective unconscious) over the necromancy and the cult to the ancestors, represented for the telluric and intempestive aspect of the Queen of the lightennings. But this eastern tendency of seeing a kind of 'Eve' in Oshum and a `Lilith' in Yansan has a reason. Let us leave this question for a moment and go back to the subject of the mirror, searching now to observe as the legend of Oshum is decisive for its understanding. Chained with their backs turned against the light in an underground jail, the prisoners can only see, out of the men, animals and figures that pass in the exterior, their projected shades in the back of the Cave. When one of the prisoners manages to get free and return to the exterior world, he is blinded by the Sun light and only in a while manages to adapt himself to the new reality. He notices, then, that the world in which he lived was unreal and unconscious, made of shades and reflexes of things. However, the prisoner would risk his life if, returning to the interior of the cave, he tryied to reveal to his old fellows the unreality of the world where they were. Probably, they would kill him. In this brilliant image, Plato not only summarized his conception about reality and language, but also trasmited his personal experience, more precisely, its philosophical explanation for the tragic destination of his master, Socrates, forced by the Athenian authorities to drink poison due to his intransigent defense of a more objective vision of reality. And he was not the only one. Giordano Bruno generally heads a long list of martyrs of science and objective thought, victims of the ignorance of men enslaved by their subjective representations of the reality. However, the development of the scientific thought was not, as the common sense makes us think, a gradual accumulation of information, but, in contrast, a series of methodological overturns, with successive model changes. The concept of paradigm itself - 'a joint of cognitive and espistemological structures' – came from a long methodological quarrel on the scientific revolutions (12). Nowadays, however, we live in a moment where the scientific rationality and its objective vision of the universe had knocked out the majority of the ideological illusions of the subjective representations. We could say, using the image of Plato, that all men had freed of the cave and its mirror, and that now despise the phantom images that we were felt in captivity. In this new context, the shades had become symbols of unconscious - that 'rational men' deny, but that come back on their dreams and on the involuntary reflections of their imagination. Moved by self-knowledge, the men who currently decide to 'come back to the cave and to his old mirror' are considered wild or eccentric. It is no longer a matter of knowing the objectivity, but to observe the development of the Inter-subjective conscience, and understanding its language. Then, for example, in the scientific paradigm of astronomy, we know that the Earth moves around the Sun; however, we keep depending symbolically on the subjective paradigm of astrology, that as language of the unconscious, conditions attitudes and behaviors. By the way, on the contrary of what the science historians think, the geocentric system does not mean that Ptolomeu believed that the Sun moved around the Earth, but actually that he placed the matter of the objective representation of the universe in a second plan ahead the idea of deciphering the destination through the specular observation of the stars. The contemporary methodological task is to establish a third paradigm of representation that conciliates the scientific objectivity with the symbolic function of the language developed by the brain left hemisphere, that integrates our astronomical knowledge in a new astrological symbology, that relates the mirror in the bottom of the cave to the sun and the exterior world. The modern ocultists that study the Hebrew Cabala (13) have a curious theory regarding God, Man and the Woman. For them, the fact of Man to be the image and similarity of God implies that both could never see each other face to face. But the woman, due to the fact that she have her neurological system inverted in relation to the dexterous masculine, could see God face to face. According with this rule, men in the magic rituals and religious ceremonies would have to always turn themselves back to the altar and facing the female participants - what in fact happens in many religions. In this proposition, while Men is the image and similarity of God, the Woman is its symmetrical inverse, its mirror. Thus, Man can only see God through the woman and God needs her to give birth to His son. This position of ‘primordial reflex', of mediation between the Creator and the creature also has a universal character among the many goddesses that represent the great cosmic mother. Thus, if ‘the universe is a dream of Brahma', if ‘the world was created so that God would be reflected and get to know Himself', this mirror, a second cosmogonic moment in many mythologies is always an ‘feminine’ element’. In this general and strictly symbolic direction it is that we can associate Oshum to Eve, an genuine feminine archetype, while Yansan, turning her back to the sun, would correspond to the archetype of the masculinized feminine. The central meaning of the narrative lies in the fact that Oshum, in the situation of imminent danger, trancended her condition of object-woman and associated with the Sun, she abandoned the traditional reflective use of her mirror to use it in a technological, rational, solar way; as a laser shotgun. The legend, then, represents the cognitive union between the brain hemispheres and the epistemological integration of the paradigms. In the Mirror, we find the intersection of two forms of living and thinking the time: the gradual elapse of the events registered by the memory and the eternal present of the virtualized world of the ideas. Or, as Saint Augustin said, “the memory of the things of men and the memory of the things of God”. We came to an end. Only a rememberance will remain to the ones who had not recognized themselves in this text, that no matter how hard they search to another double with which they could identify, will always find the feeling of incompletude so keen to the mirrors and to its instantaneous multiple reflexes - given the vastness and the complexity of this permanent subject. (3) SATZ, MARIO. O Dador Alegre. Ed. Ground. 1991. (5) BALTRUSAITIS, JURGIS. El Espejo. Madrid: Miraguano. 1988. Cited by Satz, M. Ibdem. (7) E. MEYEROVITCH. Les Songes et leur interpretation chez le Persans, Paris, 1959. (8) MAESTRO TOZAN. Hokyo Zan Mai, Samadhi del Ilusorio Treasure. Adiax, Barcelona. 1981. (10) ELIADE, MIRCEA. Tratado Histórico das Religiões. (11) Reescrito a partir da narrativa descrita no Timeu, Ed. Abril. (13) FORTUNE, DION. A Cabala Mística. Ed. Pensamento. 1986.